Last weekend I went to meet John’s fiance’, Erin’s parents in Mt. Airy, NC. Yes, that is the town that makes it’s claim to Mayberry and Andy Griffith. In fact, when you go into the town proper the theme music to the show can be heard as you walk the streets. It is really a fun place to visit. But my visit was focused on meeting the family, which I absolutely loved, and talk about where to put things at the wedding. Erin has always wanted to get married in her parents yard and, after the visit, I certainly see why. The landscaping and the yard and setting will be perfect for a small wedding and a fun party afterwards. There won’t be much need to do a lot of decorating because the yard is just so pretty but, there is a simple path that Erin will walk with her dad to get to the front yard. Alison, Erin’s mom, showed me a photo of an idea that she had seen in a catalog that she thought would dress up the path and add some color to the backdrop of greenery. So this post is to show you what I have come up with and to show you how that you can make your own wine bottle flower vases for a party or just to add some interest to a part of your yard that you want to add some color. The photo here shows the vases from the catalog that Alison showed me. And at $40 a piece for 6 of these it would be really silly to spend that much money on such a simple idea. By the time you add shipping and tax to this you are looking at about $300. YIKES! I just can’t imagine spending this for these. Last year we had some really strong winds and when that happens there is usually trees and branches that get broken or dislodged from the area. Our neighbors below us had a crepe myrtle bush that was almost destroyed and the branches from that enormous bush have been in the alley way between the houses since then. I simply put some of those branches to use. This project cost a total of $12.75 and will make use of old bottles and will keep some brush out of the landfill. Every little bit helps, right? old branches or twigs, you could use bamboo, I suppose if you have access to some of that. I used old crepe myrtle branches that were fairly dried out and brittle but were of good size and were strong. The first thing I did was to go through the stack of brush and discard the really badly crooked ones and look for straight ones or ones with character. Then I cut them to about a 4 foot length. They are all a bit different but that adds to the overall look. Then I cut the bottom of the branches so that they were flat to the ground. I cut the rods in half and took the cable ties and attached the rod to the bottom of the branch leaving about 9 inches below the bottom of the branch and attaching about 9 inches to the bottom of the branch. The cable tie will help to stabilize the bottom so that you can tie the upper part of the rod with the twine. You will have a cable tie at the bottom of the branch, but it will be in the grass and closer to the top of the rod you will have the twine. The branch can slide up and down on the rod but you want it to be fairly tight. To attach the bottle. I used two pieces of twine that were about 36″ in length and wrapped one around the bottom perimeter of the bottle and one around the top perimeter of the bottle. Tying the twine as tight as you possibly can the bottle will be sturdy against the branch. Stand your bottle stake upright and take it out into the yard and, with a hammer, tap the rod into the ground. Make sure that everything is upright and sturdy, fill your bottle with water and add the flowers of your choice. I used the flowers that were blooming in my yard. I think these will work nicely against the shrubbery at Alison’s house and will add some color to the path as folks take their seats and give some floral decoration to the walkway that Erin and her dad walk in on. Another option would be to paint the branches white… I might end up doing that, but for now I think the natural look works well, given the setting. 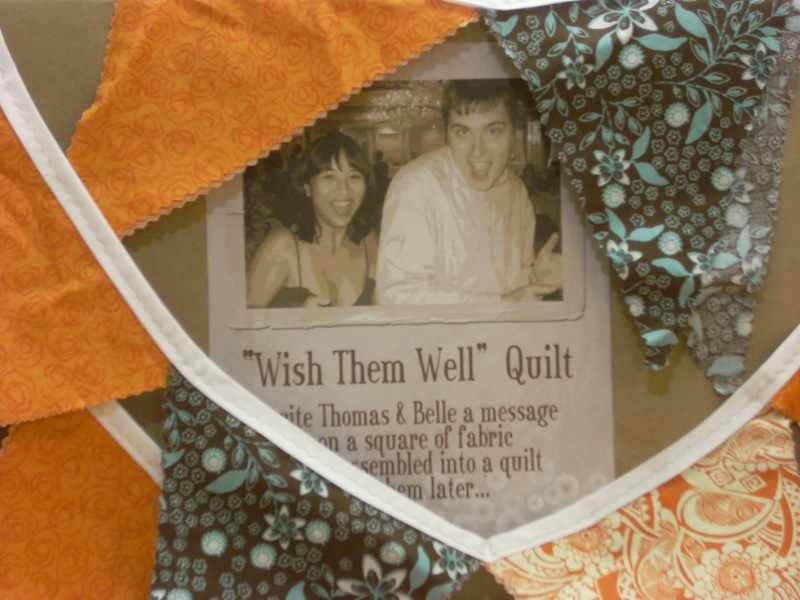 Now that the wedding is over and we are adjusting to the idea of Thomas and Belle moving to Seattle, I thought I would use my evenings to start assembling the “Wish Them Well” quilt that I put out for the party here at the house in September and also at the picnic the day after the wedding in Arlington, VA. This way I could envision, while working on it, them seeing the messages that their friends and family wrote for them in their new apartment in Seattle. Their new apartment is all white, as most apartments are and I see this bringing some color into that space and helping them settle in. I envision them either hanging the quilt on the wall to look at or using it on the sofa to snuggle under while they watch movies or TV. Today, I thought I would share my progress on the quilt and let you in on the fun. To start, this is an old idea. Quilters call this type of quilt a “signature” quilt and they have traditionally been made to commemorate a special occasion. I thought of doing this for my own wedding but didn’t. My idea at that time was to use it as a guest book instead of an actual book. 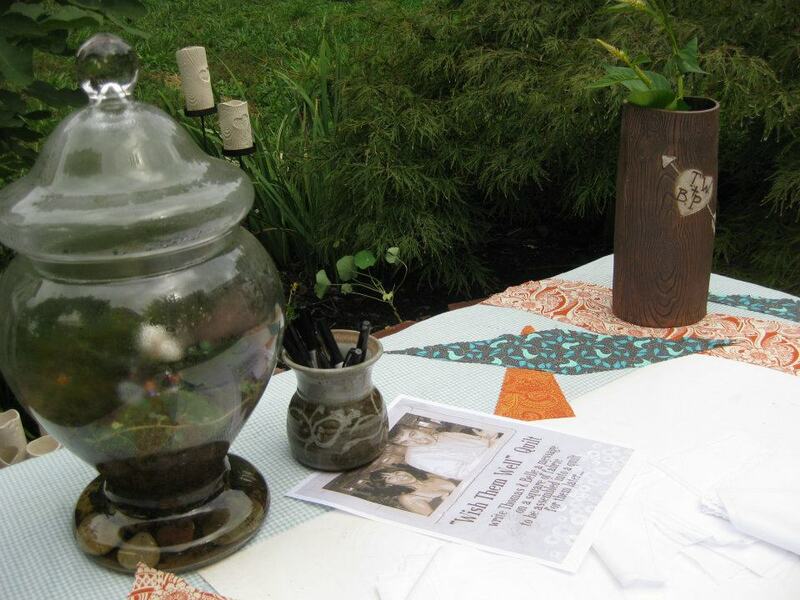 To have guests sign a square as a way to know who shared our day with us. I have now seen, on the web where folks have done this idea to send off a co-worker, to welcome home a soldier or to share memories of grandparents. So it was only fitting that being a quilter, I wanted to do one for my son and his new bride to begin their life together. Four inch white cotton was cut with the seam allowance drawn onto the square. Markers were put out in a basket and the sign to write them a message and we collected about 25 squares for the finished quilt. They are wonderful with some of them actually taking the time to color a drawing for the couple. 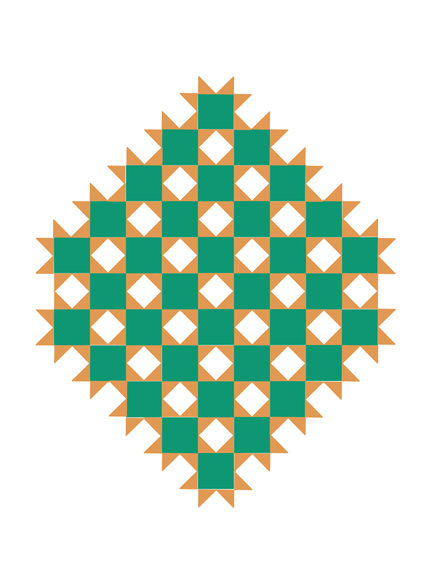 I use photoshop instead of any fancy quilt software to layout anything that I want to work on and I put together a quick layout of how I want the squares to be placed. A twin sized quilt is about 96″ x 72″ so I used that size to scale the pattern for the squares. I am not sure if the quilt will end up a twin size or a lap quilt when it is finished because there is some white space that I need to design for and I don’t know yet what to put in there. I can be a “quilt as I go” kind of quilter sometimes. So, the wishes will be the whites squares and each of the green squares will be a traditional quilt square to add interest. I am looking for traditional squares that might have some meaning to beginning a new life together. There are some really adorable cat and dog squares in the book that I am using and some on the web that I also want to add for their pets and a house square for their new place in Seattle. I have favorite patterns that I have enjoyed making through the years and I will probably add some of those. I have about 34 squares to play with so I am sure I can find lots of interesting options. 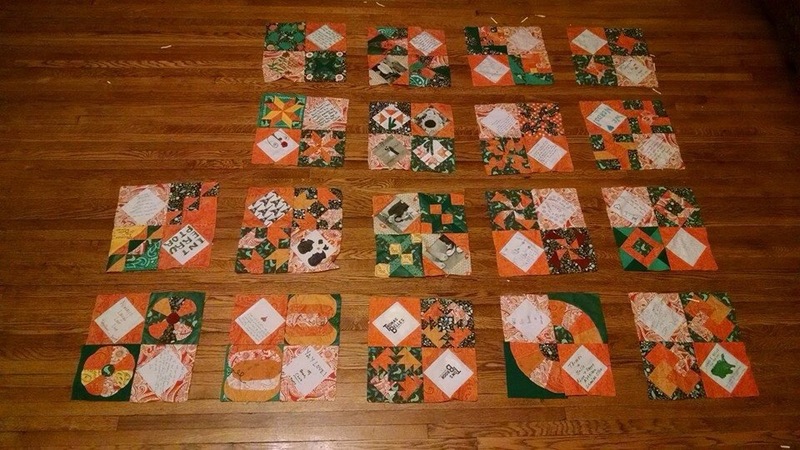 I will get all those squares done and lay out the quilt on the floor before assembling all the squares together. This way I can make sure that there is a balance of color throughout and not have a concentration of too much of one color in any area of the overall design. 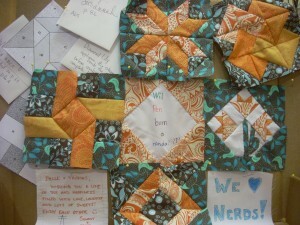 I’ve attached a gallery of the squares that I have so far and I am using my evenings to do a square a day. Not sure if the quilt will be done to ship to them for Christmas but I can certainly try. Over the years I have hand quilted all of my quilts but I may take this one to the quilt shop and see if I can have them quilt it for me. My hands are needed for other projects these days and the love that will go into the squares will show through without the added ache of putting all the stitches into the finished piece. 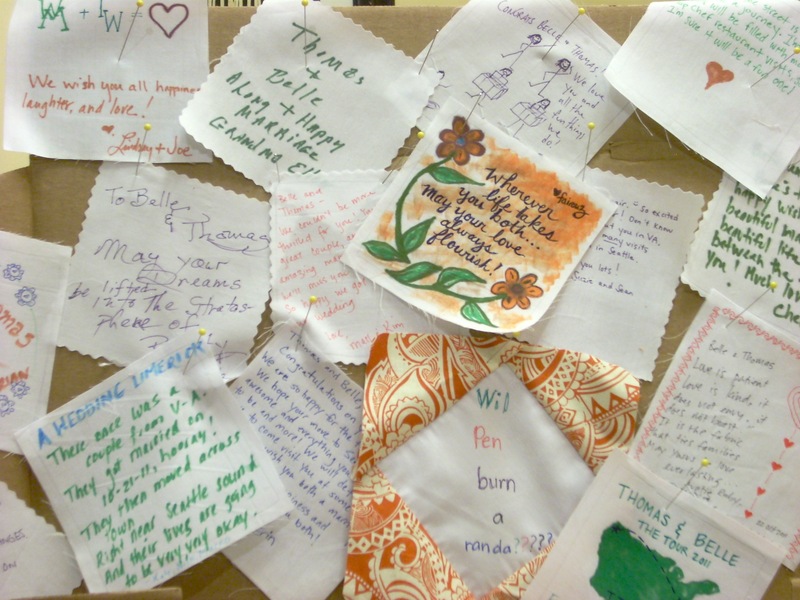 Enjoy the photos and let me know if there is a favorite square that you would like to see in the sample of squares surrounding all the wishes for a happy life in Seattle, WA. 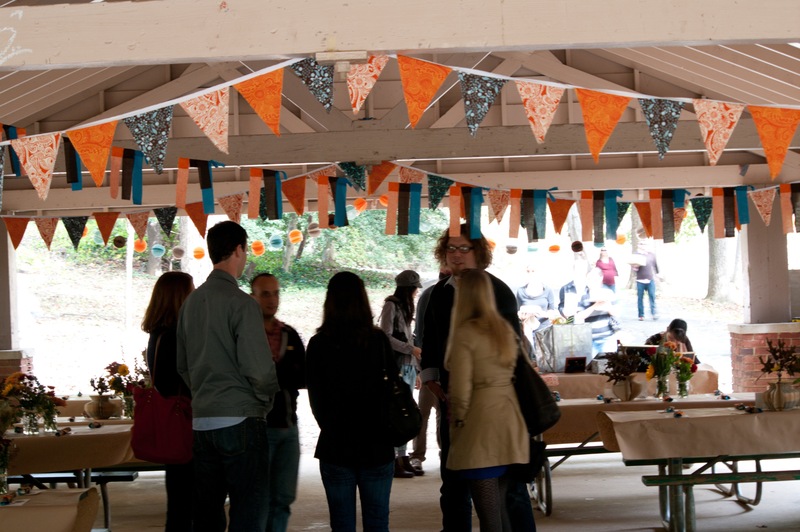 the picnic that the pennants were made for.